Dice all the veggies while the noodles boil. In the last minute of the noodles cooking, add in the veggies. (You can add them earlier if you like your veggies cooked a bit more.) Strain and run under cold water to stop the cooking process. 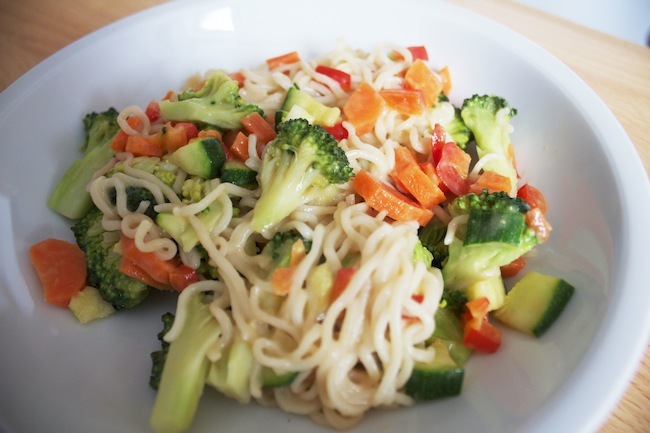 Put noodles and veggies in a large bowl. Add the peanuts and the peanut sauce. Stir it all up, eat and enjoy.